With their appearances on the Nuggets compilation and The T.A.M.I. 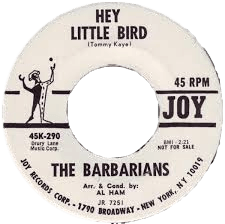 Show, The Barbarians are one of the best-remembered US garage bands of the 1960s. Not that it’s easy to forget the sight of their one-handed drummer,’Moulty’,complete with hook, driving his band through a garage punk number in the company of the day’s biggest British Invasion, soul, and surf stars. Here is their first single , both sides of which are great slices of the raw garage sound. President has just released a digital EP with all the JOY recordings recently taken from the archive tape masters, including the stereo and instrumental versions of both sides plus an alt. take of ‘Hey Little Bird’.